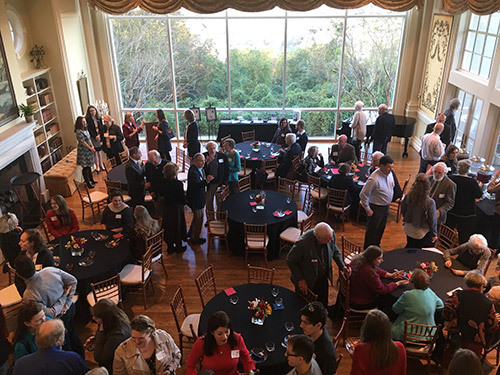 As a part of Samford University’s homecoming weekend, Samford President and Mrs. Andrew Westmoreland hosted a Daniel House reunion tea where alumni and faculty had the opportunity to reconnect with others who had studied and lived at Samford’s London Centre. Chase Ezell ’88, Mary Kathryn Covert Steel ’07 and Gaines ’87 all spoke about the impact the Daniel House had on them. Ezell, a Nashville resident, traveled to the Daniel House in the fall of 1986. The trip had such an impact on him, he and other Samford graduates went back one summer. He hosted a party in Nashville earlier this fall to help raise money for Daniel House renovations. There were even several people involved interested in donating money to name a room. Gaines was part of the inaugural Daniel House class in the fall of 1984. She discussed the impact her time in London had on her. A native of southeast Alabama, Gaines was given the opportunity to spend three months abroad in London. The trip was a challenging learning experience that opened her eyes and helped her become the woman she is today. She remembered memories the group had with the house mom, the late Barbara Hunt who died Nov. 5. She came up with creative ways to keep warm without heat and led a Bible study there. Hunt’s husband Harold served many years on the Samford faculty. “Without the semester at Daniel House, I’d be a decidedly different person today,” Gaines said, holding back tears. Steel, Daniel House campaign chair, talked about the unique fundraising efforts. There have been several milestones reached in terms on fundraising, with several companies pledging matching grants for the Funds raised so far. The Daniel House project is part of Forever Samford, the university’s $300 million, multi-year fundraising campaign.